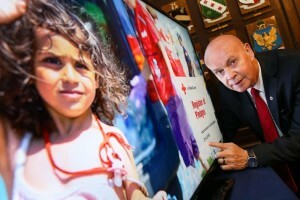 Irish Red Cross Chair, Pat Carey points the way for the Irish Red Cross Register of Pledges which will collect offers of goods, services and accommodation for victims of the migration coming to Ireland in the months ahead. Irish Red Cross today launched an online register to manage the thousands of public offers of support for victims of the migration crisis coming to Ireland in the months and years ahead. The register has been developed in response to the Government’s request that Irish Red Cross bring together public pledges of goods, services and accommodation made to organisations and State bodies in response to the shocking circumstances of migrants arriving on European borders this year. Earlier this month, Minister for Justice & Equality Frances Fitzgerald asked Irish Red Cross to catalogue the public offers and appointed the society to its Protection of Refugees Programme Taskforce. Thousands of pledges have been made to organisations and State bodies this year but data protection rights mean these offers cannot be transferred directly to Irish Red Cross. Following consultation with civil society and the Department of Justice, Irish Red Cross has created the Register of Pledges, an online interface for those who wish to re-register offers already made to other organisations. The register can also be used by people who want pledge for the first time. This will create a database which can profile pledges to match the needs of refugees leaving the Government-run reception centres to be established under the Protection of Refugees Programme. The register can be accessed at redcross.ie/solidaritypledges or by calling 01 64 24 600. Irish Red Cross Chair Pat Carey, said the Register would be a bridge between the Irish people and those coming to the country seeking refuge from conflict and extreme poverty. “Irish Red Cross is very grateful for the engagement and support we have had from civil society and the various Government agencies in developing this register. Now we need to get the message out to everyone and we are asking for support from civil society including the media. “People coming to Ireland under the Refugee Protection Programme will have escaped an unimaginably dangerous existence only to be subjected to further trauma on the migratory trail. “When they arrive here, many will likely be in shock and uncertain about their new home. But it will become apparent to them over time that, thanks to the warmth and solidarity of the Irish people, their tragic journey is at an end. This register will be a testament to that. John Roche, Irish Red Cross Head of National & International Services represents the society on the Government Taskforce. Speaking at press conference to launch the Register of Pledges, Mr Roche said: “The Government asked us to find a way to harness the tremendous outpouring of solidarity shown by the Irish people to victims of the migration crisis. “In particular, to gather together all the offers of accommodation, goods and services in one place. This register is our response to that request. “So now we are asking for public understanding in helping us honour this request by re-registering pledges made elsewhere on our website. The Irish Red Cross is a charity with a network of 5,000 volunteers in over 100 branches and units throughout the country. It has been appointed to the Government Migration Crisis Task Force. One of the society’s roles is to correlate of victims of the crisis. The Irish Red Cross was founded in 1939 and is part of the International Red Cross/Red Crescent Movement which is established in 189 countries around the world with a membership of 13 million. Its work includes fundraising at local and national level to pay for its 93 ambulances and minibuses, and several health & social care programmes that include community-based therapeutic massage, skin camouflage and community resilience programmes. Its Restoring Family Links service reunites families separated by conflict, natural disaster and forced migration while its 1,000-strong youth section is involved in First Aid, promoting social awareness and inclusion. It also raises funds for humanitarian operations abroad that include support for victims of the Nepal Earthquake, the Ebola crisis in West Africa, the Migration Crisis with a separate appeal for Syria. It also funds long-term programmes such as TB vaccination in India, First Aid and transport in Gaza, and a livelihoods programme in Niger helping 100,000 people in 75 locations. Donations to Irish Red Cross appeals can be made at redcross.ie or on 1850 50 70 70.